Guitar Center has opened a 28,000-square-foot flagship store in the heart of New York City's Times Square. To help enhance the experience expected by the millions of tourists that flock to the neighborhood each year, Guitar Center’s Pro Audio division, GC Pro, helped with audio and visual installs throughout the new store. 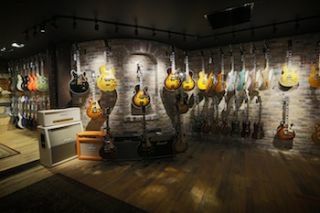 From a pro audio standpoint, the most impressive part of the new store is in the Platinum Club, a customized room that houses a number of specialty and vintage guitars, and also acts a performance space and recording studio for musicians passing through. GC Pro hired Horacio Malvicino of Malvicino Design Group as a consultant for the room acoustics.Upon entering Guitar Center at 218 West 44th Street, guests descend escalators designed to give the experience of entering a concert stage, using a QSC loudspeaker system projecting the sounds of a cheering crowd, controlled by QSC’s Q-Sys, with a crowd displayed on an Elation LED video screen. Greeting visitors outside on the street are six 55-inch Panasonic thin bezel LCDs that serve as “the marquee of the store,” Plushner said. From a pro audio standpoint, the most impressive part of the new store is in the Platinum Club, a customized room that houses a number of specialty and vintage guitars, and also acts a performance space and recording studio for musicians passing through. For the room design, GC Pro hired Horacio Malvicino of Malvicino Design Group as a consultant for the room acoustics, to make sure the sound was as isolated as possible for performance and recording purposes. “This will be a functional live sound club,” Plushner said. In the main space, an Avid S3L controls the FOH, with a set of JBL VRX speakers installed for the club. For recording, the S3L sends the mix to an Avid S6 controller in a separate studio control room that includes a set of Adam S3X studio monitors and a variety of outboard gear including a Manley Pultec, Universal Audio LA-2A, and Empirical Labs Distressor. The store’s pro audio section includes a powered speaker wall, where visitors can test out the PAs on site before a purchase, as well as walls of microphones, production/recording software, and more. Guitar Center’s Affiliate program helps connect in-store customers to systems integrators and other contractors for professional installation. Beyond the expected walls of guitars, drums, keyboards, and other musical instruments for sale, the new store also houses nine customized lessons rooms, each treated with Auralex acoustic panels for soundproofing. And to give the music history enthusiast a reason to stop by, the new Guitar Center store will be the permanent home to two of Eric Clapton’s guitars, including his famed “Blackie” Fender Stratocaster. In 2004, Guitar Center bought the guitar for $959,500 at a Christie's auction held to raise money for the drug and alcohol rehab center Clapton founded, the Crossroads Center. At the time, the bid set the record for the world's most expensive guitar.